As it is related to chemical, biological, radiological, nuclear (CBRN) threats, or emerging infectious diseases*, Medical Countermeasures research and development is unique and requires specific solutions throughout the process of data capture and analysis. The easyTEL range of implants offers researchers the ability to record temperature from small to large animals, along with activity (and different biopotentials and/or blood pressure), depending on the model. Temperature and activity are recorded continuously during up to 8 months for rodents and up to 475 days for large animals. In iox2 acquisition software, 2-7 days of baseline recording produce an average daily temperature curves for each subject. After dosing, measured temperature is compared to baseline data at same time of day. 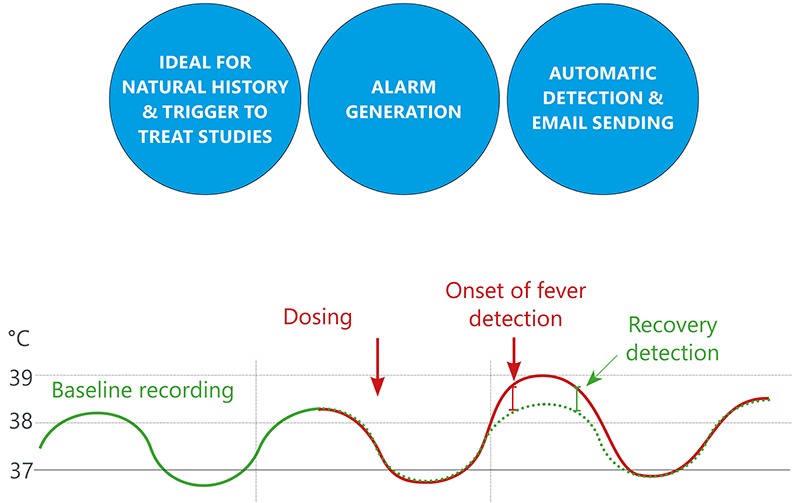 Onset of fever is detected if measured temperature exceeds baseline by more than preset threshold. Introducing a new software application into an organization working in a regulated environment, especially in biosafety containment structures, involves many complex business processes and can be tedious and time-consuming. To comply with regulatory requirements, optional GLP modules can be activated with each emka TECHNOLOGIES’software.